Cabot Problem-Solver Primer is an exterior primer specially designed to provide maximum performance through a faster drying and higher-hiding formulation under Cabot Solid Color Stains and high quality exterior paints. Available in both water-borne and oil-based formulas as regulations allow. Cabot Problem-Solver Primer has superior resistance..
Cabot Problem-Solver Primer is an exterior primer specially designed to provide maximum performance through a faster drying and higher-hiding formulation under Cabot Solid Color Stains and high quality exterior paints. Available in both water-borne and oil-based formulas as regulations allow. Cabot Problem-Solver Primer has superior resistance to extractive bleeding and moisture problems and facilitates the application of a quality finish coat within just a few hours. The oil-based product is a 100% alkyd primer and dries in a fraction of time compared to traditional linseed oil-based primers. The water-borne product is widely available and has easy soap and water cleanup. 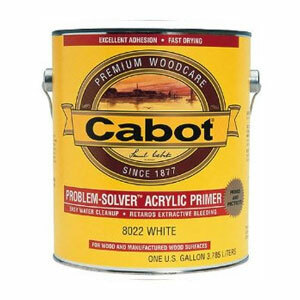 Cabot Problem-Solver Primer will yield outstanding results on siding, shingles, plywood, and on both smooth or rough-sawn surfaces. It is also suited for application over previously oil-based stained or painted surfaces. One gallon covers from 150 to 500 square feet, depending on product used and condition of surface. Cabot Problem-Solver Primer is recommended for use on extractive-prone wood species such as red cedar, redwood, mahogany and fir. It is also excellent when applied to pine, cypress, spruce, and even pressure-treated wood. This product has exceptional adhesive properties and can be applied immediately to new, dry, unseasoned, mill-glazed (smooth) siding.